This isn't a rendering. The Telluride tosses some real dirt. 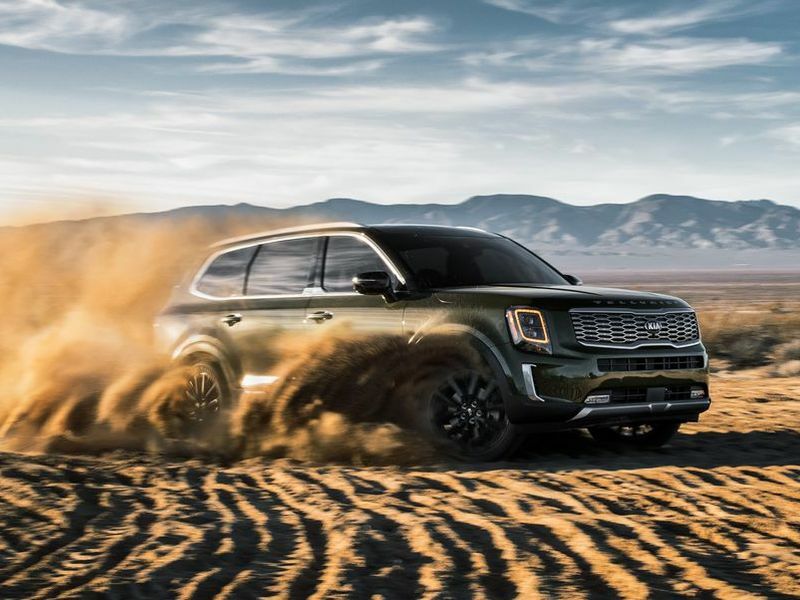 Now that the Hyundai Palisade SUV has gone live, it's time for Kia's Telluride to shine. Just released at the Detroit Auto Show, we have to say the Telluride looks far better than its sister vehicle. The original concept gave us a taste of what the Telluride could be with its handsome boxy exterior, big tiger nose grille, and off-roading capability. Now, it's official, and Kia will start building it soon. The Telluride ditches the swoopy look for a more utilitarian and boxy look. It pays off. The Telluride looks so close to its original concept (even that great pea-green paint!). The grille isn't nearly as tall, nor are the headlights the same. The production version has vertically oriented LED beams, while the concept was horizontal. There's not as much curvature to the long hood, but there are stylish creases that give it presence. The adjoining door handles were ditched for more conventional ones, and that silver fender vent isn't anywhere to be seen. Much of the 2016 Telluride Concept carried over to production but not the rear lounge seats. There are neat styling cues that did make it, like the silver tabs at the base of the B-pillar and the scalloped surface at the leading edge base of the front doors. The new Telluride looks more unified in its execution overall, and the result is a more refined look from the front of the vehicle all the way to the taillights. We also like the dark wheels better than the chunky silver ones on the concept. The shape of the taillights remains the same, though they're thicker and not as long. Whereas the smaller but still 7-passenger Sorento looks good but not distinct, the Telluride carves out its own niche with the boxy shape and the almost European styling. It's big without looking hulkingly imposing, and we'd dare to say it rivals the Range Rover in terms of sophistication. It might even come across as a body-on-frame rugged SUV based on its boxiness, but it's still a unibody construction, so it won't drive like a truck. Kia's best execution of their brand grille gets a stylized frame and great chrome mesh. Though the production version doesn't get the really appealing one from the concept with this big second-row lounge seats, we think the actual interior looks even better than the concept. It borrows some Jaguar elements (grab handles on the center console) and even some Mazda sophistication in the long wood (faux) and aluminum (plastic) dash. There are also quilted nappa leather seats that look as good as those found on premium vehicles. At least those are real. The overall look is excellent, and it sets the bar high for Kia. If you didn't think Kia interiors were upscale, the Telluride should change your mind. Under the hood is a 3.8-liter V-6 that's used in the Hyundai Palisade. It's good for 291 hp and 262 lb-ft of torque that drives the power to either a standard FWD setup or optional AWD via an 8-speed automatic. AWD manages the torque split from 100 percent to the front wheels to a 65/35 front/rear split when Sport mode is selected. Though details on tech and other amenities haven't bee disclosed, we do know that a self-leveling rear air suspension will be available, as well as rear occupant/pet sensors and Hyundai's Rear Occupant Alert that prevents passengers from exiting if the vehicle senses a vehicle approaching from behind. More details are coming soon including price and standard and optional equipment. Kia will start selling the Telluride this May. We'll provide our full review when we get our hands on it.